Over the next week or so you are likely to see the new ‘Poppy gems’ stamp a few times. I have already stamped it in four different colour schemes and varied the mediums and styles. This one is by far the ‘busiest’ and is quite the contrast to the clean and simple stamping I have been sharing lately. I created this earth toned panel initially with just brown and black but after doing most of the blending with water I decided to add a bit of red to the petals over the brown. I stamped with distress stain and pulled it into the petals and leaves with a paint brush. I added black with the elegant writer pen which bleeds pink and green tones when wet. I decided to add the text details after the flowers were finished keeping it loose and watery with the addition of water to both the stamp and panel. I stamped the text upside down the first time so I had to make it blurred so my error would not be less noticeable! I die cut a few flourishes with the new ‘flourish and butterflies’ die and attached them to the base for a tone on tone detail; you can just make it out in the photo below. The sentiment is stamped on a tag from the new ‘ gift card pocket’ die. Thanks for dropping by; I hope you are enjoying a relaxing weekend. This card is a beauty! I love the earth tones, the color of the flowers, the blurry background – it all works together so well. Beautiful work, as always. Stunning! Always enjoy your work! Outstanding. This card really speaks to me. such a gorgeous card. i love it! Pick me up off the floor. oh, to have your talent!! Perfectly… just perfectly. !!! Love that card so much! Gorgeous! Who would have thought they would look so good in brown tones! Very nice! Heather, this is just beautiful. I just love your work! WOW! this is just awesome! if you give a class on this card I am willing to travel from Quebec to your place for sure. Count me in. Why say more than Beautiful! BEAUTIFUL!! WOW, what a beauty… LOVE the coloring, in conjuction with the earth tones! 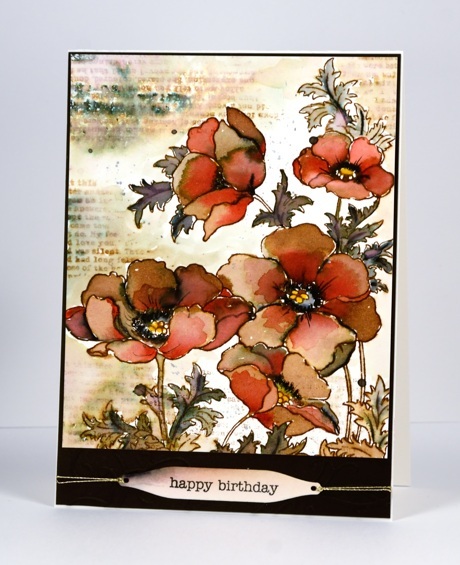 Great background for the warm-coloured poppies ! Your card is a real beauty, a piece of art ! love everything about this card! Awesome! I can’t imagine the feeling of the person who received this card! This is spectacular! What a beautiful image – and the overall look is stunning! If you are i invited to the white house for the Presidents birthday (gift mandatory) — the card alone is gift enough!!!! Gorgeous!!!! I agree with all the other comments. 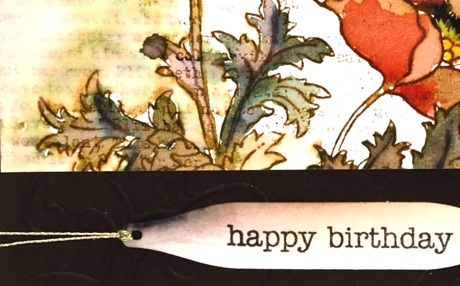 This is a fabulous card, and I love the way you do your vintage coloring. Incredibly beautiful.